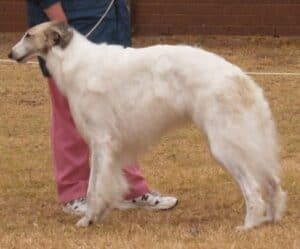 The Borzoi was developed by mixing a Russian thick-coated breed with an Arabian greyhound and has been bred by the Russian royals for centuries. They were designed to chase hares, foxes and wolves over Russian’s vast open lands, often in packs of over 100 dogs. In America, they were called the Russian Wolfhound until 1936. 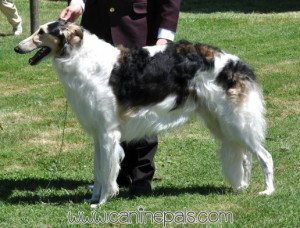 The Borzoi hunts by sight, not smell. His silky, long coat can be curly, wavy or flat and may be any colour or colour mixture. He needs lots of exercise but must be kept in a fenced off area or on a leash as he’ll chase anything he sees. He’s affectionate but is similar to a cat in that he prefers his independence and is very undemanding. He must have regular bathing and brushing. The male will be a minimum of 28 inches high and the female will be at least 26 inches high. Their weight can vary from 60-105 pounds.